This article will illustrate you the way to enable or disable secure sign-in in Windows 8 or later using Registry, Security Policy Editor. We’re regularly posting on Windows 8 and hope that you guys are enjoying our stuff. Today we’re going to post yet another possibility for Windows 8. In Windows 8, secure sign-in provides an additional layer of security that guarantees that the authentic Windows sign-in screen appears, protecting the system from programs that mimic a sign-in to retrieve password info. Actually we have three different methods to make this done. Pick your best method and move on. 1. Press + R and input netplwiz in Run dialog box. Click OK.
2. In User Accounts window, switch to Advanced tab. Check Require users to press Ctrl+ Alt+Delete to enable secure sign-in. This option is unchecked by default. Click Apply followed by OK to get desired results. 2. 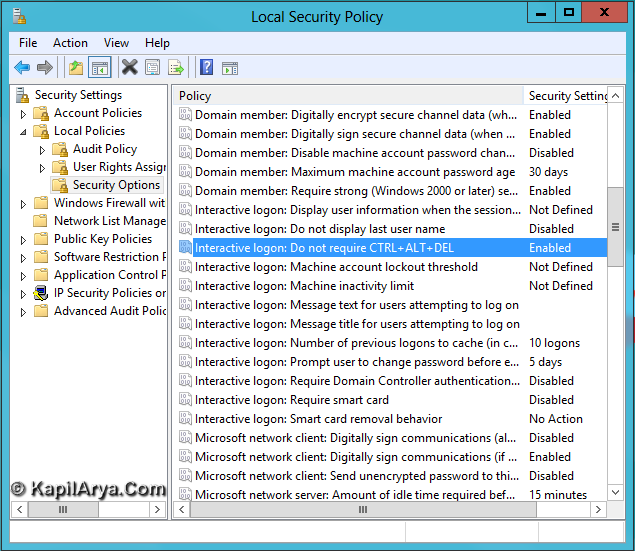 In left pane, click Local Policies then Security Options. Now in right pane, look for Interactive logon: Do not requires CTRL+ALT+DEL. By default, this is set to Not Defined. 3. Double click on above shown policy and you’ll get window shown below. To enable secure sign-in, you can choose Enabled and to disable secure sign-in, pick Disabled. Click Apply followed by OK to get results. NOTE : If you choose Enabled, the option shown in Method 1 will be automatically greyed out. To make that option working again, you have to download and run the registry to disable secure sign-in provided in next method. In this way, you can enable or disable secure sign-in very easily. thanks.. . .. .. .
i was able to enable it but cant set it not configured again, help please!!! @alicia,you can use disable registry script as mentioned. omg esc stops on securesign-in!! !